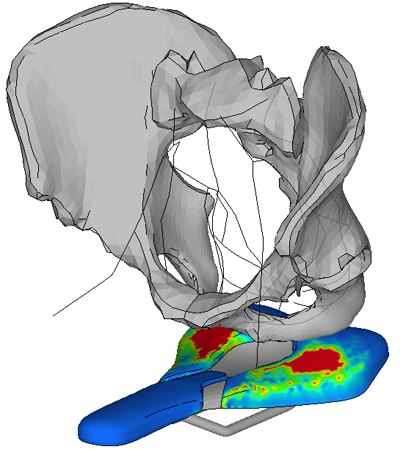 How is pressure mapping on a saddle performed? A pressure mapping foil with sensors is placed on the saddle. As soon as the rider gets on the saddle, the pressure is mapped with approx. 100 pressure mapping sensors and the result sent to a computer. Thanks to the remote transmitter, the pressure mapping can be performed statically in the lab on a trainer or dynamically in real life on the trail. The pressure distribution is displayed by colour: blue represents low pressure, then the pressure rises from turquoise through green, yellow, orange to red. 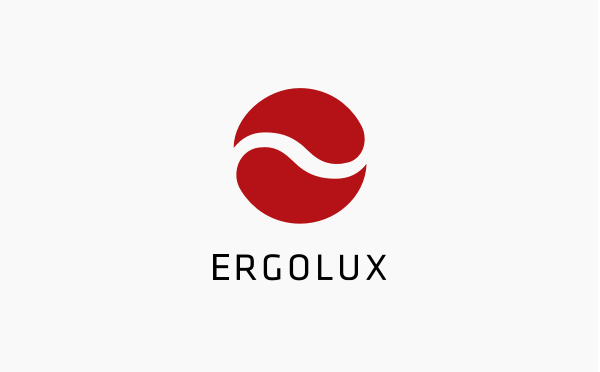 The two-stage wave form fits perfectly to the mostly bulbous ischial branches and offers at the same time an optimal relief of the sensitive structures of the perineal area. 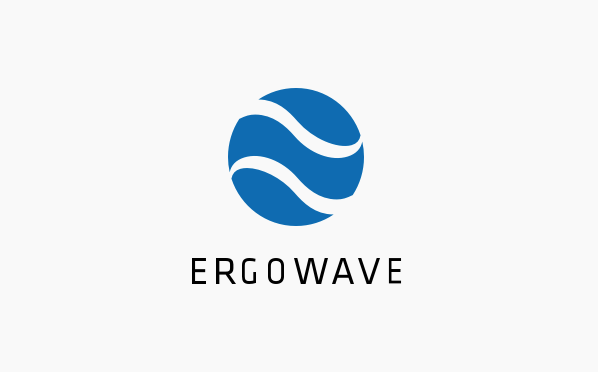 The SQlab Ergowave ® is the result of a three-year research cooperation with the Frankfurt University of Applied Sciences.. The pressure mapping diagram shows an optimal pressure distribution from a medical stand point on the sitbones (red) and pubic bones (orange/yellow) and almost no pressure in the perineal area. Shows increased pressure (yellow to red) in the perineal area and in the area of the pubic bone arch. Shows concerningly high pressure peaks on the sides of the perineal area, where important arteries and nerves are located. In the centre the blood is able to flow well, but numbness will still be an issue. Pressure ulcers in the perineal region! We have only been able to find reports of this problem in connection with the hole saddle design. Our measurements, investigations and experiences confirm that this problem has not yet occurred with our stepped saddle design with the saddle width system. The lower-lying saddle nose normally reduces even the lateral pressure on the perineal region more than sufficiently. As early as 2015 (Mountainbike Magazine 6/2015), a sports ergonomist reported the risk of pressure ulcers caused by the edges of large-hole saddles. Issue 4/2019 once more reports that scientific studies have found high pressures at the edge zones of the saddles with holes. Pressure sores reportedly rarely occur when the forward-leaning riding position is adopted. How can this be explained from a medical point of view? Pressure sores are familiar to people who experience severe pain or have restricted movement, or both, to such an extent that they develop "bed sores", also known as decubitus. We assume that pressure ulcers are actually a rare occurrence during cycling. Before tissue and nerve cells die off, the pain would most likely prevent the cyclist from continuing. According to the study, significant danger arises when numbness occurs in combination with the ambition to finish the race. Problems occurring far ahead of the development of pressure ulcers are apparently more frequent. Before the tissue and the nerve cells die off irreparably, it can be assumed with a high degree of certainty that strains will have already occurred, i.e. the combination of pressure and shear forces on the perineal area and the nerves and blood vessels present there can lead to a reduction in sexual performance. "Even for bikers who wish to ride in the forward-leaning race position for performance reasons, this pressure shift to the edges of a recessed saddle is advisable. Only rarely can pressure ulcers arise here. " Since, as described above, many complaints can occur before a pressure sore irreparably damages the structures of the perineal area, this recommendation is incomprehensible from a medical point of view. "Gliding along as if in a sedan chair with SQlab active ....... and hardly any pressure on the perineal region." SQlab became the first saddle manufacturer to introduce a system to measure the distance between the sit bones and to calculate the optimal saddle width.